Founded in 1969, the Addison County Chamber of Commerce plays a vital role in the success of Addison County’s business community. 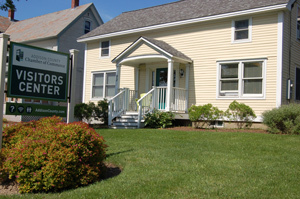 With a full-time paid staff, the Chamber operates a Visitor Information Center just outside of Middlebury’s downtown. The Addison County Chamber is responsible for promoting the county as a tourism destination, responding to inquiries from visitors and residents as well as providing referrals to member businesses. The Addison County Chamber is a vital resource for the business community by providing governmental affairs programming, educational forums and opportunities to meet other members to create and nurture connections. The Chamber’s mission is to enhance the economic vitality of Addison County. Please contact us by phone, email or in person. The Visitors' Center is open Monday through Friday, 9 a.m. to 5 p.m.